The SUNY Oswego men's hockey game will offer one of many highlights for the Oct. 26 to 28 Friends and Family Weekend at the college, facing the Carleton Place Canadians at 7:30 p.m. Oct. 27, in Marano Campus Center arena. OSWEGO – Family and Friends Weekend at SUNY Oswego will run Oct. 26 to 28, showcasing the artistic, academic and athletic activities of students, while offering a smorgasbord of education, recreation, information, entertainment and food. The SUNY Oswego men’s hockey game will offer one of many highlights for the Oct. 26 to 28 Friends and Family Weekend at the college, facing the Carleton Place Canadians at 7:30 p.m. Oct. 27, in Marano Campus Center arena. Comedian Jonathan Burns will demonstrate why he locked up the web domain “flexiblecomedy.com” as he returns to headline SUNY Oswego’s Family and Friends Weekend entertainment. The veteran of shows from Letterman to Leno, from cruises to Kennedy Center, Burns will bring his own brand of flexibility, curiosity and goofiness to Marano Campus Center’s auditorium for free shows at 1:30 and 3 p.m. Oct. 27. Burns last appeared on campus for this gala weekend in 2013. Student groups will provide their share of entertainment for the weekend. The Gospel Choir will perform at 7:30 p.m. Oct. 26; the music department will present a concert at noon in Hewitt ballroom, featuring the College Choir, Chamber Singers, State Singers, College Orchestra and Concert Band; the college’s show choir, Vocal Effect, will appear at 1 p.m. Oct. 27 in 101 Lanigan Hall; and the Shaun Cassidy Fan Club will showcase improvisational humor at 8 p.m. Oct. 27 in 315 Park Hall. At 6 p.m. Oct. 27 in Hewitt ballroom, the Image Step Team will host a “Stomp the Oz Step and Stroll Competition,” featuring SUNY Cortland, University at Albany, Syracuse University and SUNY Oswego’s Lambda Sigma Upsilon and Lambda Alpha Upsilon. Tickets are $8 and are available starting Oct. 10 at any college box office, online at tickets.oswego.edu or by calling 315-312-3073. 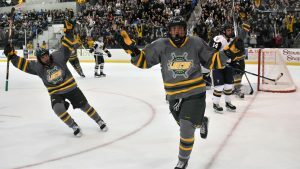 SUNY Oswego’s NCAA men’s hockey team will face off with the Carleton Place Canadians in an exhibition game at 7 p.m. Oct. 27 in Marano Campus Center arena. Tickets for the general public are $8 and are available at any college box office, online at tickets.oswego.edu or by calling 315-312-3073. SUNY Oswego students with current ID can get their free ticket at the Marano Campus Center box office and purchase up to three additional tickets on Oct. 22, for student seating sections 54-59. The entire arena seating will open up for everyone on Oct. 24. In addition, the men’s club hockey team will play two games (8 p.m. Oct. 26 and 2 p.m. Oct. 27) and women’s club hockey will play once (12:30 p.m. Oct. 28). Always popular with young children and their college-age siblings, the annual Mini Carnival will take place from 1 to 3 p.m. Oct. 27 in Marano’s Swetman Gym, featuring games, face painting, coloring, a bounce house, balloon animals and snacks. Penfield Library will celebrate the 50th anniversary of its current building from 11 a.m. to 3 p.m. Oct 27 with activities including a used book sale, scavenger hunt and an into-the-past photo booth. Families can also have a lively family portrait taken from 1:30 to 2:30 p.m. Saturday near the Division of Extended Learning Office, 151 Marano Campus Center. Additional attractions include Tyler Art Gallery exhibitions at the main gallery in Tyler Hall and the branch gallery at Oswego State Downtown; a Career Services open house in the Compass, 145 Marano Campus Center; tours of Rice Creek Field Station, a mile south of campus on Thompson Road; Shaun Cassidy Fan Club student improv comedy troupe; lap swim, a splash-in movie, open recreation and a 3-point shooting contest in Lee Hall; open ice skating (for a small fee) in the arena; and all-you-care-to-eat meals (charges apply) in selected dining halls. To register or for more information, visit oswego.edu/familyandfriends.